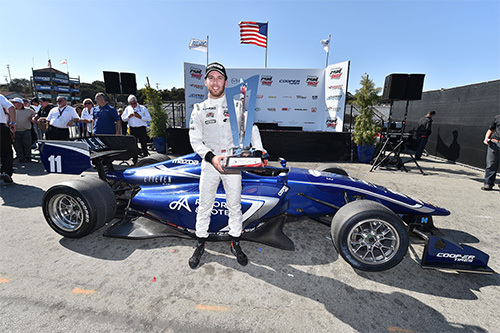 Ed Jones kept his composure and showcased his raw speed in a pulsating finale to the 2016 Indy Lights campaign at Laguna Seca last weekend, as the talented Dubai, UAE-based ace was justifiably rewarded for a stellar sophomore season with the coveted championship crown and a guaranteed drive in next year’s iconic Indianapolis 500. Six contenders arrived in California with a mathematical chance of lifting the laurels – a measure of the Mazda Road to Indy series’ ultra-competitive nature this year – but come Saturday night, that number had been reduced to just two, as Jones converted a close second spot on the starting grid in a thrillingly fast-paced qualifying session into the same result at the chequered flag in race one. Having entered the weekend sitting just one point behind chief rival Santiago Urrutia in the standings, the 21-year-old Brit drove with consistency, maturity and poise as he artfully withstood sustained pressure from Zach Veach, who was rarely more than a second adrift of Jones’ 450bhp Carlin Dallara IL-15 single-seater and didn’t allow him even the tiniest margin for error. It was precisely the kind of performance he needed to produce, and the result not only represented the former European F3 Open Champion’s eighth podium of the year, but more significantly, it turned a one-point deficit into an eight-point lead ahead of Sunday’s eagerly-anticipated and all-important showdown as his tense duel with Urrutia went right the way down to the wire. With his second-best qualifying time securing him his eighth pole position of the campaign – underscoring his status as the quickest driver in the Indy Lights field, with none of his adversaries having notched up more than three – Jones was eager to finish the job off in style but found himself unceremoniously shuffled down to fifth on the opening lap after an aggressive move by Veach forced him out wide. With Urrutia running second, the pair were tied on points and had things ended that way, the Uruguayan would have taken the title on countback. The Williams-Harfield Sports Group protégé refused to be beaten, however, and by dint of digging deep and pushing hard throughout, he flashed past the flag in fourth position to dramatically scoop the spoils. It was a thoroughly well-deserved triumph for a driver who had boldly steered his burgeoning career stateside last year, and in addition to the Indy Lights championship trophy, Jones also earned himself a $1m scholarship towards a three-race programme at the pinnacle of US open-wheel competition in the Verizon IndyCar Series in 2017 – including a prestigious slot on the grid for the 101st edition of the legendary Indianapolis 500. “What an amazing feeling!” he enthused. “I think it’s fair to say this season has been one of the hardest ever in Indy Lights, with such a high calibre of drivers and teams and seven different race-winners. Santi in particular has been a fierce rival all year – we’ve enjoyed some fantastic racing and it’s been a really close and exciting battle for the title. “Laguna Seca is a classic American circuit and the perfect setting for a showdown, and having been strong there last year, I knew we would be in with a really good shout. Although the stakes were obviously sky-high, I tried to treat it like any other race weekend and not get caught up in the emotion of it all. We focussed firmly on the job in-hand, which was to score more points than Urrutia – and that’s exactly what we achieved. “Qualifying was hectic to say the least, but we lined up ahead of Santi for both races so that was the first box ticked, and whilst we didn’t quite have the pace to challenge the leader on Saturday, we knew what we needed to do and we followed that plan to the letter. Veach was always there, but we had him under control. “On Sunday, I got a good start but there were a few drivers out there who tried to take advantage of our situation by pulling some risky moves and Zach could afford to gamble going into the first corner because he was aware I had everything to lose. Knowing fifth position would not be enough, I concentrated all my efforts on gaining ground and we pulled it off in the end. “As a team, we’ve worked so hard over the last two years, and it’s incredible to get the reward we deserve. I’m immensely proud of everybody involved. With the reputation that Carlin has in Europe, there was inevitably a certain expectation that they would carry that form over to Indy Lights, but I think a lot of people underestimate just how tough it is here – not to mention how different the racing is! “It’s easy to forget that Carlin is still relatively new to competing on this side of the Pond, so for them to win the championship in only their second season is hugely impressive and I owe them a massive ‘thank you’ for giving me such a great car throughout. At the end of the day, this is a team sport and this title is for all of us.